In part 1, we explored how each drawbar brings a certain harmonic into the sound. It’s the combination of drawbars at various levels that gives us the array of organ tones we’ve come to know and love. 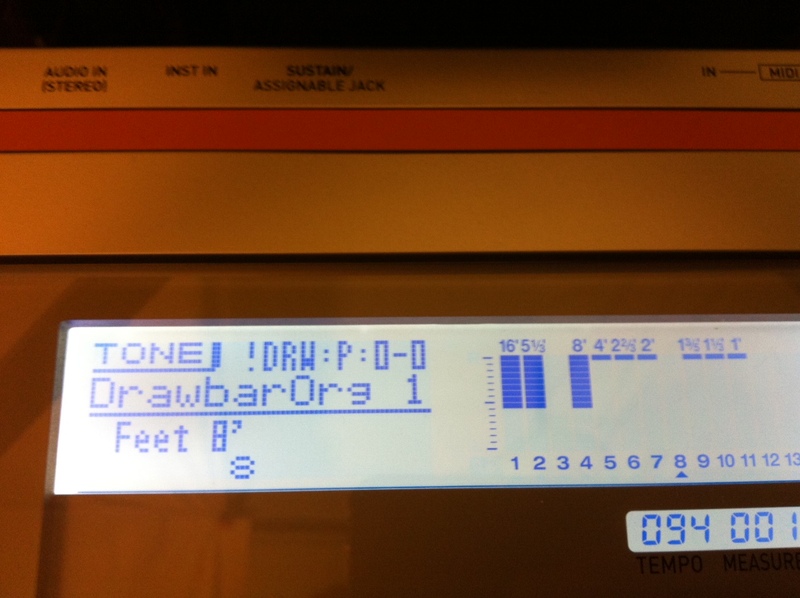 Once you get a sense of how the drawbars function, we can make some user preset settings. If you’ve used a mixer before, it makes sense. Turn it up, turn it down. Think of a drawbar like a reverse volume fader. All the way UP (0) is silent, and as you pull the drawbar DOWN, you get increased volume level from 1 to 8. Why is it like this? On a vintage drawbar organ, the idea is that all the way “in” is “closed”, and bringing the drawbar “out” (towards you) “opens” it up, letting its sound come through. As you can see, there’s also a visual of the overall drawbar setting on the right side of the screen. A drawbar preset is often described as a row of nine numbers from left to right, with each number representing a drawbar position. In the case of the photo above, that setting would be described as “888000000”. This is a classic setting that can be found in PRESET DRW:P0-0 “Drawbar Org 1”. Try matching this setting by pulling “out” the lowest 3 drawbars, and pushing “in” the others. Remember, with the XW-P1, you can change the sound while you play, to tweak the drawbar settings to your liking. Once you find a sound you like, you can save it as a USER PRESET. This is a major part of getting a great organ tone, but there’s even more to it. Next time we’ll cover percussion, vibrato, and rotary effects. This entry was posted on June 18, 2012 by Tom Brislin. It was filed under Drawbar Organ, XW-P1 and was tagged with Casio, Drawbar Organ, Tom Brislin, XW-P1.